I'm definitely sticking to that 90 minute thing, it's just that, right now, you can't see it!! Yesterday I fixed up a few things over at Socoder.net. I added a nice upload gallery on the right, and fixed up a few little annoying bugs that needed tweaking. Then, at 10pm, I decided to make a new game. And the game went well. And the game got done. At the start of the game, I considered redoing it for the iPod, so I took the time to figure out the sizes, so that it'd all fit on there. At the end of the game, I started to get all creepy and paranoid. I haven't played a game like that, and I quite like it. It's fun, it's puzzley, and it's got legs. But... If I put the Blitz game online, now, someone might nick it!!!! I wondered how easy it would be to do. And I starting coding it in my head, and working out a way to get the spritesheets to work, and figuring out how to get the titlescreen going, and doodling all the backgrounds in my head. Then I realised I'd had WAY too much coffee! At 3:30 in the morning, I trundled over to the Mac and powered everything up. I was half-asleep, I was full of caffeine, but I gave it a go. I didn't quite get to the point where I started added gameplay, but I'm really happy about the fact that I managed to get some lovely card-flipping sprites onto the screen, and managed it all within the space of only 3 hours, whilst half asleep. On Friday I had a really rather productive day, and managed to build up my iPhing knowledge quite a fair bit. I didn't have enough time to do a 90-minute thing, though, and am quite disappointed by that. Saturday came and went, with most of the kitchen getting it's new ceiling up, and no 90-minutes being spent, again! Today I aim to play catchup, although how much of that gets done will remain to be seen. First off, there's a few things over at Socoder that need tweaked, so I'm going to go and fiddle around with those for about 90-minutes or so. If I have extra-time after that, I'll come up with something interesting. I've not done my "90 minute" challenge again, today. Well, I did spend about 6 hours figuring out the iPod development stuff, but that wasn't the point of the 90 minute thing, really, was it!? There's a silly "Vuvuzela Hero" picture going around the net, and I think it started right here, although I'm not 100% sure. If you're a regular, you've probably played my stupid Cowbell Hero game, and I figured.. why not! I stripped out the Cowbell, and added a stupid blinkin' horn. This is that.. A downloadable, vaguely playable, Vuvuzela Hero game. Props to the Vuvuzela Hero guy. Using the buffers I mentioned earlier, and pasting 100*32x32 pixel sprites onto those buffers (32x3200 pixel buffers) I've created 8 completely independent reels, each with their own selection of 100 slots. Drawing onto those reel buffers slows us down, and takes around about 2 or 3 seconds to do, so you wouldn't be doing that in realtime.. But once the reels buffers have been drawn, we can slam them up on the screen with pretty much no slowdown whatsoever. Essentially, that's just drawing 8* pictures on the screen, and it can do that without any hassle at all. After that, I've still got about 30 pictures that I can draw without hitting any slowdown. 1 will obviously be the foreground overlayed image, then you've got the buttons, and the cash display, things like that.. But those will be easy enough to add, and shouldn't take me over the sprite limit. So, um, yeah.. There's that! This is (finally) some actual iPhing development progress!!! OK, so I finally got my DevLicense, and the first thing I did was to slap the test engine onto my iPod Touch. If you've tried that, you'll probably found exactly the same thing that I did. ...that, rather than going "Weeee!" it went "... plod... plod..." at about 2 frames a second. Today I've been experimenting with all kinds of things. I've figured out how to draw images to a "buffer", and then have that buffer be one of our UIImageView things, so that it can be drawn over and over again. I've also found that having 50*full-screen UIImages runs at about the same speed as 50*32x32 pixel images. Seems that the bottleneck isn't the size of our images, it's the system trying to deal with all the "physical" objects. Maybe I can fix that later, but right now it's not an issue.. Essentially if you put those two pieces together, you can make yourself a lovely scrolling background image (drawn onto a big buffer), have a lovely scrolling foreground image (drawn onto another big buffer), a few more parallax layers on even more buffers, and then slap them all together with about 40-odd sprites sprawling around the screen. Well, yeah.. that's plenty for now. I'll post a bit of info on how this all works, at a later point in time. Gotta neaten it up, first! It's a MESS!!! Try to get as high as you can. WarioWare is cancelled, this week!! It's half past midnight, and 90 minutes in, Tuesday's 90-minute-game isn't going to quite fit into the amount of time I'm going to be awake!!! I'm half asleep, already, and when you start spotting typing errors in your code, you know it's time to sleep. So, I'll finish this off in the morning. Then it's time to activate my lovely iPhing Developer's License, and see what fun garbage I can come up with. Yeah, probably won't have time to do anything Wario'y, sorry.. But, hey, 3DS!! Am I right!?!? woo!!! You could say that this week's been a bit of a cheat. An update isn't REALLY a whole new game. 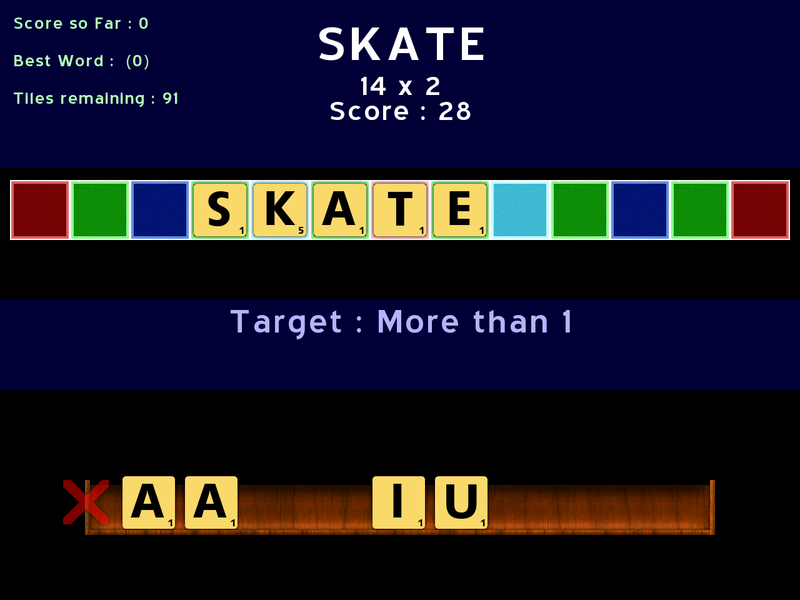 But then, I also made ScoreRack, this week, too.. So it all evens out! An early caffeine fuelled start has lead to a nice NeonPlat trailer, which actually took about two hours... But who's counting!? I didn't keep a track of how/when I pieced this together, mostly because I kinda just jumped into it this morning, but it went a little like this..
1. Grabbed this, which is amazingly the only video screen capture program that's EVER managed to record audio in my games!!! Frankly, that's bloody well amazing!! Program suggested by the guy who made this video. I asked, He replied, Job done. Much appreciated! The game can't quite keep up at 1920x1080, but it did manage to capture at 1440x900, so that's good enough for me! 2. Grab clips of levels. .. except it took about 7/8 attempts to get the order looking "progressive", and it's still not 100%, but it'll probably do as it is! Oh, my, what a crazy old week it's been!!! I spent most of Wednesday upping bits of NeonPlat, Thursday was a weird day with lots of odd bits being done, and then by Friday I had the stupid idea of 90-minute-work-sessions..
As such, NeonPlat hasn't had a lot more done to it. I've still a day to go, and I'll probably get a few pieces sorted, but don't be expecting as much as was originally expected. Still, we have ScoreRack as a new game, for this week, so at least the ratio's up!!! or whatever else I decide to call it..
A little rushed, today, but still managed to slot my 90 minutes in. Today's productivity probably isn't useful to 95% of readers, but I spent the time tweaking the Upload Gallery, over at Socoder.net. The gallery no longer attempts to load every single thing you've ever uploaded all at once, and instead shows your latest 20-odd files. If you want it to take ages loading everything, you can still get it to do that, or you can use the little search box. There's also the option to allow others to view your recent uploads, along with a way to do that. So, not much use to you, but handy for me! For my second half, I decided to try my hand at some music. Here is a possible theme tune for NeonPlat2. I probably shouldn't have bothered!! Wasted a good hour, there! I'm off to watch the season finale of Stargate Universe! Meanwhile, here's my first 45 minutes. Not sure what I'm going to do in my other 45 minutes, but the first half turned out ok! .. although it took up all of my 45 minutes!!! And it really wasn't meant to take that long!! "That'll be a quick job", thought me. Decide to keep my "Tunnel of Flinging Screenshots", and rather than just have that as the "200 Games!" 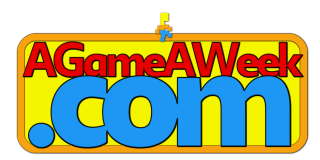 trailer, I'll mix it with the AGameAWeek logo on top, so I can reuse it at the end of game videos, rather than my usual "And here's the logo" thing. .. waiting.. They're big 1920x1080 pics..
Load EditStudio, shove video into there, add logo, re-render. Tweak render, since it's completely freaking out at the thought of having to do things in widescreen. Retweak render, since it's still messed up from the aspect switch. .. rendering 1920x1080 videos takes ages! Gonna have to redo it again, in a jiffy, 'cos EditStudio still doesn't like rendering to xvid! ..It'd be nice to have this at the front-end of games, but I'm not sacrificing 42Mb just to do it!!! and trying to figure out HOW to play the video, nice and quickly! Rerendering in VirtualDub with compression. Test video with something quick.. Grab a WarioWare clip from the other day, shove that at the start, pop the new endy thing at the end, re-render. Takes AGES, even for a quick 15 second test, mostly because it's reading an xVid compressed file..
Might've been a bad idea doing that, but I didn't want 2 great big 6Gb video clips constantly sat on my HD! Well, that didn't go to plan, but it's not entirely awful, either. In fact, it's turned out so nicely that I've even added it to the Archive. AGameAWeek just took a turn for the weird! 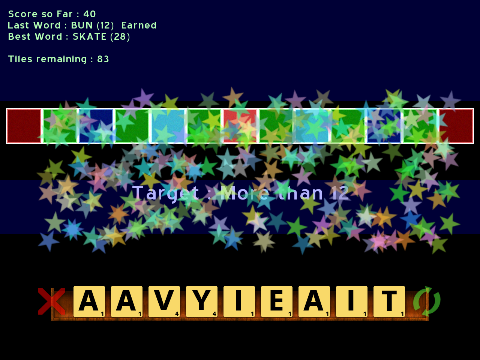 Today's quickly made game was made in about 4 hours, and is a nice Scrabble inspired wordgame. You have a rack with tiles, and you place them wherever you'd like upon the grid. You also have a Score Target. If you fail to hit that target, you don't get any points for your word. Sometimes the target will be "Get More than ...", and sometimes it'll be "Get Less than ..."
If you're completely stuck, you might want to hit the Swap Tiles button.. But that'll use points, so use sparingly. If you get rid of all the tiles, you get 100 bonus points!!! Or if not, keep whatever you have, and get out!!! Draw Tile rack, grab texture from Google, add layers, add shadow, job done. Half Time, Relax, Make a Brew!!! Note, my BlitzMax Framework handily contains a ready made WordList, so I can be super lazy and not have to deal with that. Create TileBag, and couple of function to deal with it. Add simple grid layout, and empty tilerack. Place random letters into rack, draw rack. Movement fixing, lots of "latching", things moving nicely. 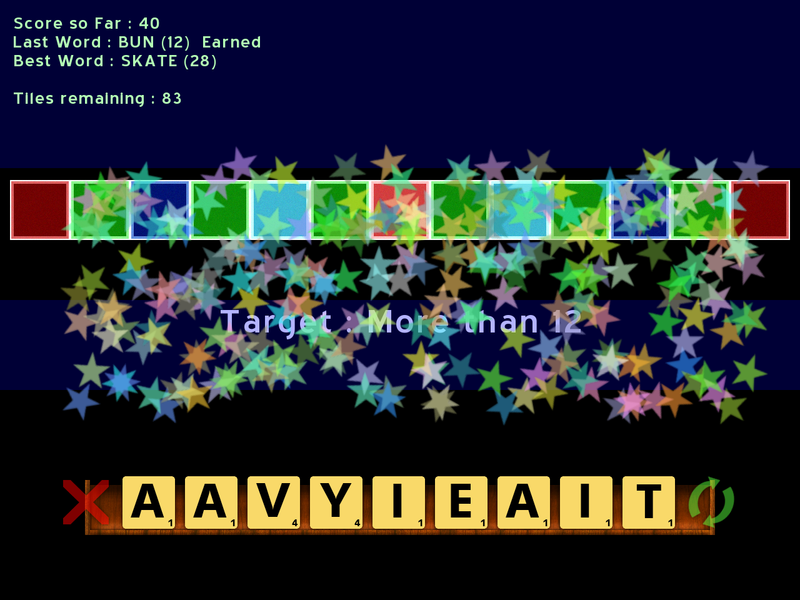 Adding big X, game nearly done..
Used the time of about 2 matches, by now! Never mind! Tweaking here and there to make the game nice. Will probably do, at this point, but since I'm way over schedule, I might as well shove some Audio into it, to finish it off..
Fruityloops and Cooledit are used to tweak some sounds into existence. It's that time of year again, where everyone goes absolutely nutso over some stupid game of football. In the coming weeks, 95% of the world's population will be watching up to 64 games of stupid football. That's over 96 hours worth! ...I'd rather be doing something much more productive. 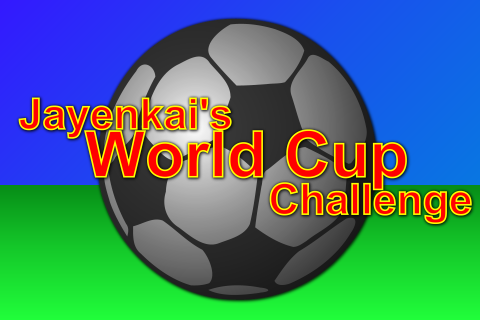 So, I've decided to setup Jay's World Cup Challenge. Every day, over the world cup, (that's today June 11th, all the way up to July 11th), I'll be taking 90 minutes out of my day, and trying to do something productive. Maybe I'll write a game, maybe draw a stupid picture, make a piece of music, create a video for youtube, who knows. But each and every day, I'll be settling down for two 45 minute sessions (with a coffee break inbetween!! ), and spending the time doing one particular thing for that day. Then, each day, I'll post the results here. If you're also desperate to ignore the Football, why not join in! You can post your accomplishments in the comments, and I'll try to come up with some sort of nice calender, or something, to show off everyone's greatness.